Tractus (big ink drippers) is an ink dripping performance created to accompany Victor Adán's composition, Tractus. 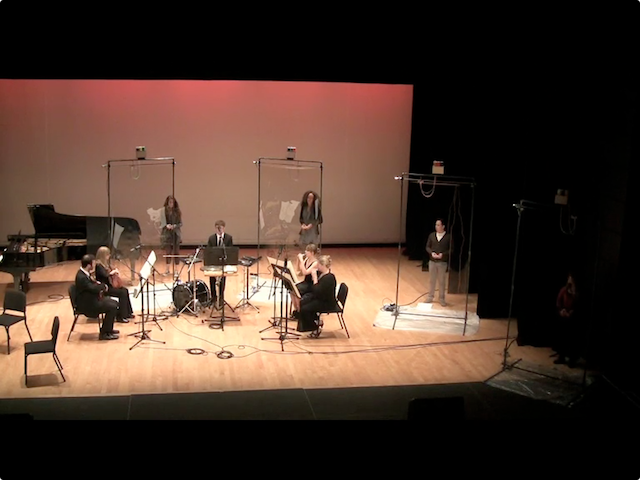 It was premiered by Talea Ensemble as part of the Extended Play Marathon: SONiC Festival at Miller Theater in NYC October 16, 2011. I built four large ink dripping machines for dripping acrylic ink onto transparent vertical mylar canvases. 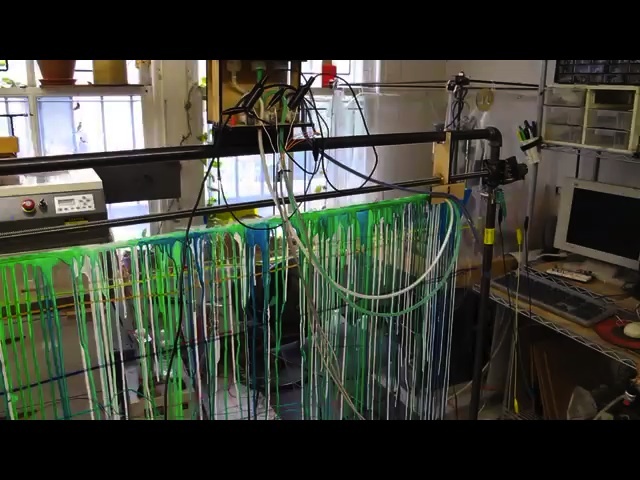 Each machine is controlled by an ink drip performer. The beginning and end of the ink drip performance is syncronized with the performance of Tractus, but otherwise the two performances are completely independent. Each ink drip performer is also independent of the others, and is free to improvise, create a compositional strategy, etc. The ink drip machines are very simple: a carriage moves back and forth across the top of the mylar sheet, dragging the ink tubes across the mylar at a constant speed. The performer starts the carriage moving at the beginning of the performance and it doesn't stop bouncing back and forth until the end. Three bottles of ink sit atop the machine. The performer has three corresponding buttons that release a drop of ink when pressed. Since the carriage is constantly moving, the only control the performer has is the choice of which ink color to drip and approximately where to drip it. Each performer chose her own set of colors.